The United States has dropped tens of thousands of graphic leaflets southwest of the Syrian city of Raqqa recently aimed at discouraging recruitment for the Islamic State of Iraq and Syria (ISIS). 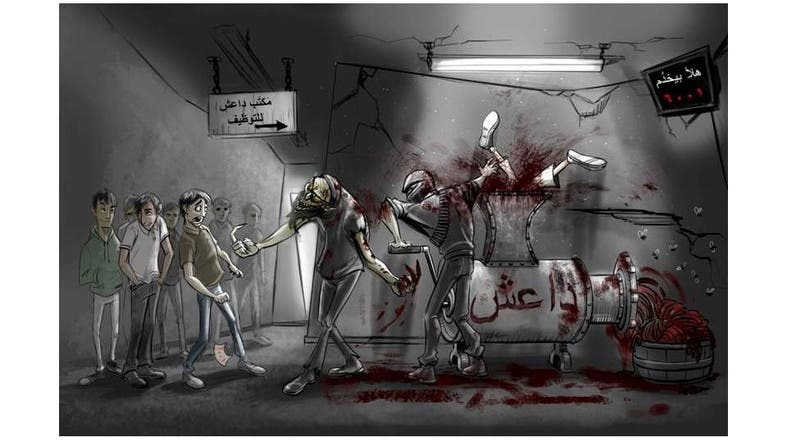 The grisly, cartoon-style leaflets show recruits lining up to be shoved into a meatgrinder and is part of what the Pentagon formally calls "Military Information Support Operations," or MISO, meant to influence thinking on the battlefield. The Pentagon said a U.S. Air Force F-15 warplane dropped about 60,000 of the leaflets on March 16. "The message of this leaflet is that if you allow yourself to be recruited by Daesh (ISIS), you will find yourself in a meat grinder," said Pentagon spokesman Colonel Steve Warren. "It's not beneficial to your health." The U.S. military has long employed such campaigns in wartime but Warren said this was first of its kind in Syria he was aware of since the United States began bombings in the country last September.